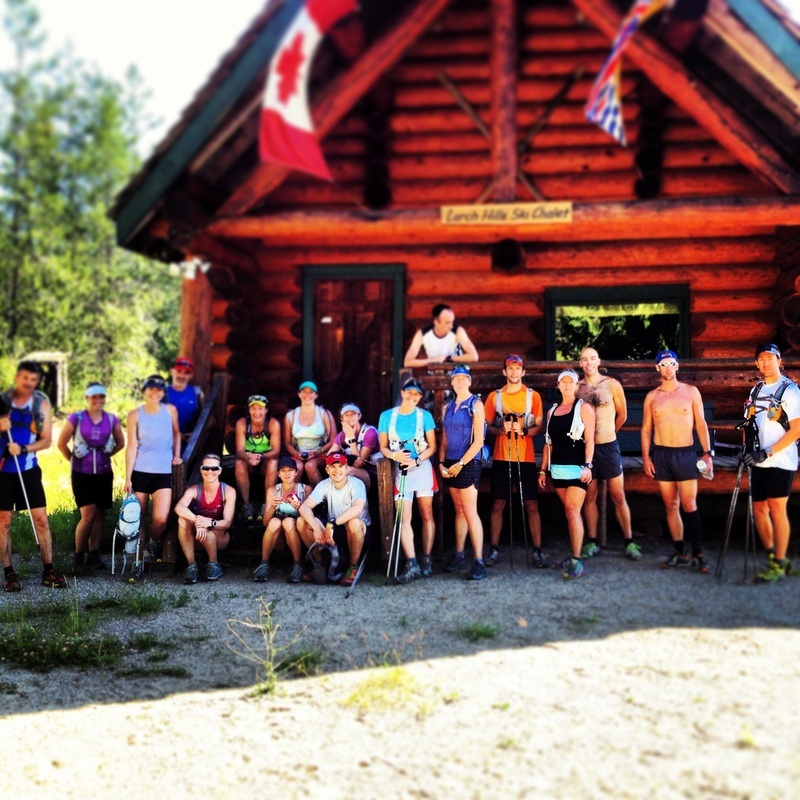 2013 LARCH HILLS TRAVERSE - A Huge Success! Thank you to everyone who participated in the 2013 Charity Run. Whether you were a runner, volunteer or donor, your involvement made a positive difference to the day. It was truly a magical event that started bright and early as Kelowna athletes had to rise at 4am and meet to car pool by 5:30am. The drive to Sicamous was approx. 1.5hrs where we met our driver volunteers from the Salomon Arm Cancer Volunteer Unit. These incredible people drove from Salmon Arm to pick us up in Sicamous and proceed to drive us back and drop us off at the start of the trail head. There were 24 of us that did the full traverse which started at canoe ball diamond. 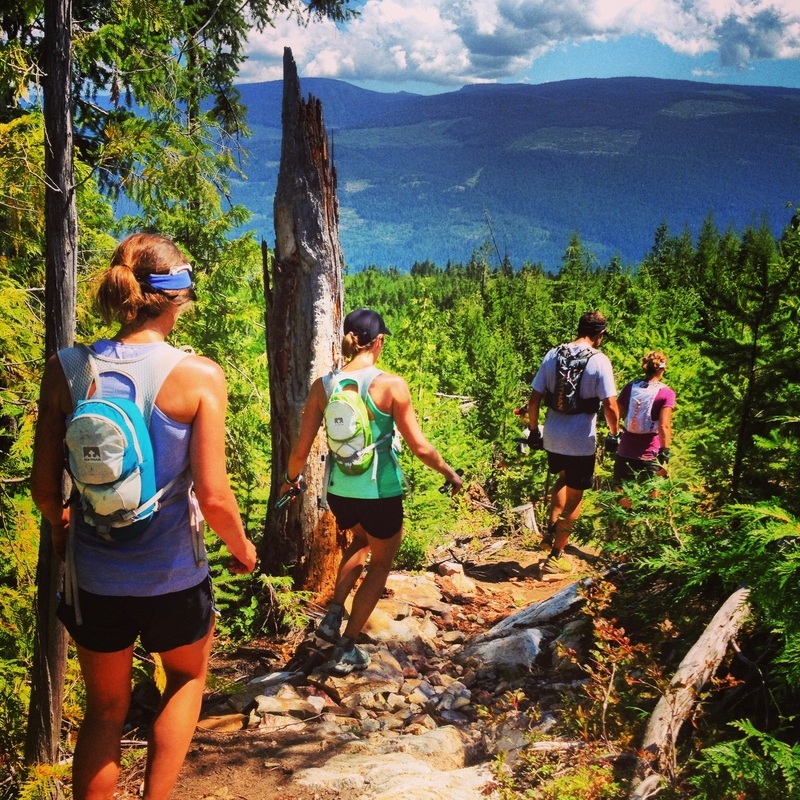 Grateful as grateful can be - we had local Salmon Arm brothers, Warren and Ron Ellis as our private guides to take us along this epic 43k traverse. The first 18k was like a bit of a maze. The boys know these trails like the back of their hands and choose a fun and challenging route to bring us to the aid station at the half way mark. We had cold water, Heed, gels, energy bars, chips etc... for everyone to fill up on. Thanks to Ellen, Simone, Sada, Jody, Jana, Ryder and Carter for their help driving up the dirt logging road to meet us and aid us. From the aid station we picked up Terry, Jody, Jana and Sada who would run 25k in the 2nd half and actual start of the Larch Hills Traverse. The trail was beautiful! Lots of swooping single track and some big climbs. The total elevation for the day as 5,000 feet and a lot of that was in the 2nd half. The views helped take our minds off of tired legs, the HEAT of the afternoon, which rose to 34 degrees and the fact that all of us ran out of water before hitting the finish. There was no room for complaining though. Best put: none of us have cancer... so our suffering that day was pale in comparison and reminded us all of what we were running for. Together we raised over 7,000 for the Canadian Cancer Society and celebrated by running right into the lake at the end of a long day. 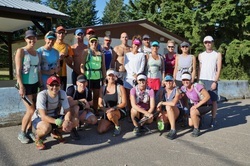 It took athletes 6 to 7.5hrs to finish the traverse and we all enjoyed a cold beer, socializing about our epic journey and prizes from our sponsors. Most of us then went to the local pub and refueled before making the drive home. I am really proud of everyone who committed and trained for this event. Who called upon their family and friends to donate and support them and the cause. Despite the amount of money raised, there is more value in an event like this. Almost everyone was running in honor or support of a close friend or family member who has died from or currently fighting this awful disease. It brought us all together and connected strong values within a community. I am already planning the 2014 routes... I hope you'll join us. while others shared how some survived. With the support from our community, friends and family, we raised over $5,000 for the Canadian Cancer Society. These funds help in cancer research, prevention and provides support services to people living with cancer. great event to train for! We will offer two different groups based on pace. It is our goal to raise $7,000 in the process. their back yard. 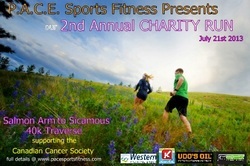 We currently have 24 people registered to run the epic point to point traverse! 2. Skip the run portion and show your support by donating to a runner to help them raise their $150.00 so they can participate. All those participating would be honored and grateful to have your support. I hope you'll be inspired to join us!